The forest laws which had applied to Sutton for centuries were revoked by Bishop Vesey in 1528 when Sutton received its Borough Charter. Now Sutton farmers could leave their sheep to graze freely on the extensive common lands, and they were quick to take advantage of this new opportunity. Soon the local court found it necessary to control the numbers of sheep - in 1558 the court ordered “that if any person has insufficient pasture land to overwinter the sheep he has on the common he shall forfeit 20s for each offence”, and there were fines in 1568 for Raphael Smith and William Barlowe for overburdening the commons with their sheep. In winter sheep were brought in from the commons to the home pastures, but sometimes the winters were hard and the sheep suffered, causing their owners to take desperate measures - in 1577 John Sharpe sent his sheep into Sutton Park, in 1582 Francis Harper was fined because he “depastured his sheep in the park and cut down holly branches growing there for his sheep to eat”. The Park Keeper, Robert Smythe, was reprimanded in 1601 for allowing his own sheep in, and ordered not to allow anyone to put sheep into the park. Every householder in Sutton was allowed to have sheep on the commons, and most of them did. Probate inventories show that James Agott, a poor husbandman, had twelve sheep and three lambs worth £3; Thomas Patterton’s sheep had seen better days - in 1690 his “twenty old sheep and six lambs” were valued at only £2.10s. William Taylor was a more prosperous farmer, and had a large flock of over fifty sheep valued at £11 when he died in 1679. The commons were enclosed in 1824 and then farmers were obliged to keep their sheep in their own fields. Sheep were important to the farmers, who practised convertible husbandry - fields alternated between arable and pasture, with a crop of beet or turnips whose tops were to be eaten off by sheep. The Monday market in Sutton was loud with the bleating of sheep - in the nineteenth century the sheep pens were set up where the Anchorage Road car park is now, convenient for both Sutton Park Station on the Midland Railway and Sutton Station on the London and North Western. 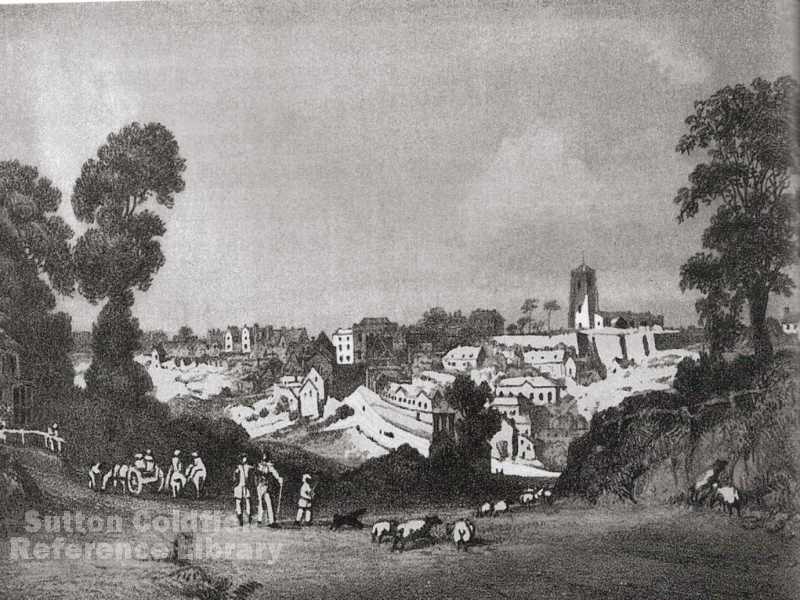 Miss Bracken’s 1840 Prospect of Sutton from the Cup, showing sheep in Birmingham Road on their way to market.